Polyurethane Body Mounts from Daystar are a more durable alternative to rubber body mount bushings and can fix body sag by correcting and maintaining the alignment between the body and frame. Find a body mount kit for your truck or SUV below. Trucks or SUVs that haul heavy payloads, or spend a lot of time traversing broken country, are rough on body mounts. The OE (original equipment) body mount bushings are made of rubber to absorb the most harshness from the road but the shape-changing force that those bushings soak up will eventually deform or crush them. When that happens your body will sag on the frame and seem lower on one side or your cab and bed won't seem to line up anymore. To fix this you have to replace the bushings but using more OE rubber will probably just delay another replacement down the road. 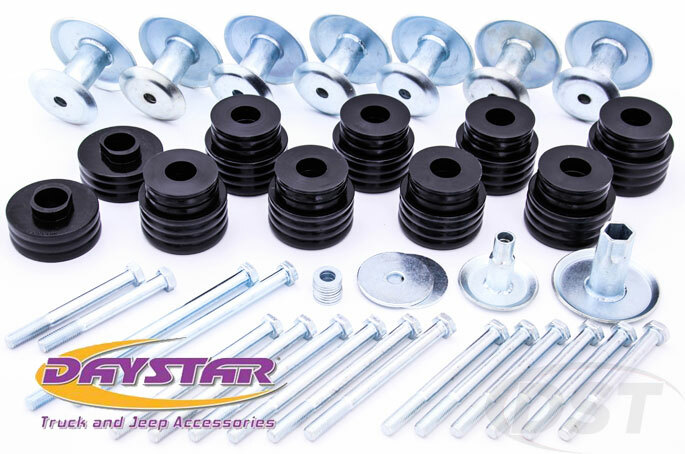 Daystar's Body Mount Bushings on the other hand are warrantied to last the life of your vehicle. Daystar's Body Mounts are made of their special blend of polyurethane which is a flexible but firm material that has a much longer lifespan than rubber. Poly bushings also brush off the elements that can destroy rubber like motor chemicals, road salts, and the constant flexing of off-road travel or long trips with a loaded bed. More vibration and noise from the road can be transferred to the cabin when compared with rubber but the durability of these bushings will stand up to the work week or weekend play. 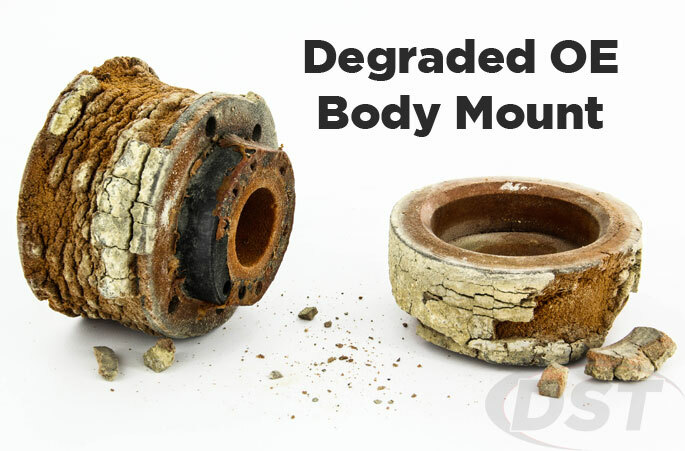 These body mounts are covered by Daystar's Lifetime Warranty and will last the life of your vehicle, keeping your body and frame securely connected and aligned. Don't just replace old worn rubber mounts, upgrade them with Daystar Polyurethane Body Mounts!